icu812az has no other items for sale. 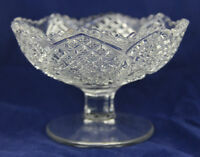 Vintage Clear Cut Glass 5-1/2" Tall Pedestal Candy/ Nut Dish!! !